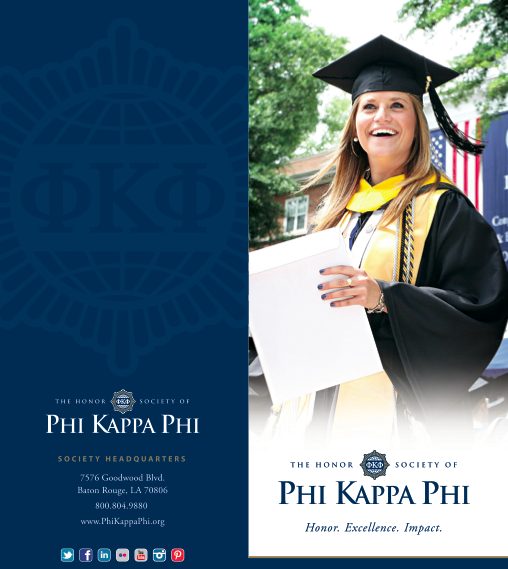 Membership in The Honor Society of Phi Kappa Phi is by invitation only to the top 10 percent of seniors and graduate students and 7.5 percent of juniors. Faculty, professional staff, and alumni who have achieved scholarly distinction also qualify. The Honor Society typically holds an initiation ceremony in the spring of each year. Those eligible for membership will receive an official invitation in the mail.To accept your invitation to membership, complete the online the Permanent Record of Election form received along with payment. It is important to maintain active chapter membership. Active chapter membership helps us create and realize the future of Phi Kappa Phi at Duquesne University as a vital resource and opportunity and participate in local chapter events. Active chapter members are also eligible for many national and local benefits. Active membership status requires paying your national Society dues as well as chapter dues annually. If you were initiated at another institution, we encourage you to transfer your affiliation to the Duquesne University chapter of Phi Kappa Phi (chapter number 187). For information on how to do this, please contact our chapter secretary, Mr. Robert Behary, or email us at pkp@duq.edu and we will forward your email. This form authorizes Duquesne University's chapter of Phi Kappa Phi to access your academic standing for determination of eligibility for membership. Members should print and deliver this form to the Director of Greek Life, Honor Societies and Professional Organizations, Rebecca Ann Jamrozik Mickler, in Union #315.